I’m always trying to find clever ways to sneak in a veggie into my children’s meals. Pinky really likes broccoli so I got a little more creative than just your typical grilled cheese sandwich and added brocolli to it. It was quick, EASY and a hit with my toddler. All it takes is 4 ingredients that are probably sitting in your fridge right now! Tear American cheese into small pieces (this helps the cheese and broccoli melt together better) and place in a bowl. Slice broccoli into fine pieces and add to bowl with the American Cheese. Next, add a small dollup of Mayo and mix them all together. Spread your margerine or butter on your slices of bread. Then, spread the cheese and broccoli mixture on your bread. Now place your sandwich in a pan or on a panini grill until the bread is grilled to your liking (I like mine slightly burnt). Enjoy! this sounds delicous. i would’ve never thought to add broccoli! Oh my gosh! I can not believe that I did not think of this. It sounds so yummy and I bet they would love it since they love broccoli and cheese. Thank you so much for sharing this but I am so stumped as to how I did not think of this before! I’m going to have to try this one for myself, it looks and sounds like a great combination. Love this! I am always looking for ways to put more veggies into my toddler’s food, and I can’t believe I never thought of this. I will be trying it today- thanks for sharing! Your welcome! Depending on how much they like broccoli you can adjust the amount you put in. If you put in just a little they won’t even taste it 🙂 Hope your tot loves it! what a great idea I think Ill do it for a cocktail party I know my guests would love it Ill slice up the sandwichs into 4 triangles for finger food thx for the great idea your the best !!!!!!!! Great idea for an appetizer, I’m sure your guests will enjoy them! I can’t wait to try this for my daughter! She loves grilled cheese, but hates vegetables. I’m sure she would eat this though! Sounds healthy, quick and easy. My youngest boys like grilled cheese. I wonder if sneaking the broccoli into this sandwich would work on my 10 year old as it does on your toddler. He dislikes broccoli and there’s always a fight on when I serve it. The rest of us love broccoli, but that child is a veggie hater,especially broccoli or peas. Always looking for new ways to slip things past him. This is a great way to sneak in those veggies. I like your thinking. This sounds really different & good. What a great idea. 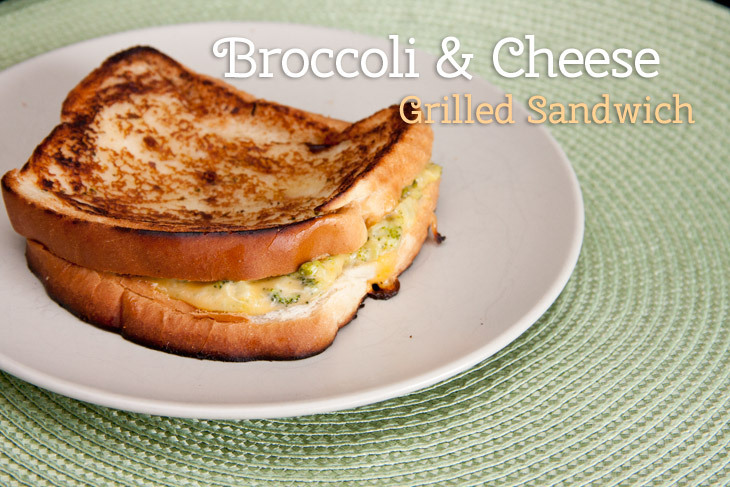 I never thought of adding broccoli to a grilled cheese sandwich. I think I will try it on my grandson and see if he will eat it. If he doesn’t, I will. Debbie, Good idea 🙂 I enjoy them myself too! I don’t think my grandson would even notice the broccoli! What a great recipe idea! this is an interesting twist on a grilled cheese sandwhich and looks yummy. I like that it adds somehting healthy. My son loves broccoli and think he would enjoy this. This one stopped me right away and what a great idea you had to put the broccoli in here. Genius! That’s such a great idea! Never would have thought to add broccoli. Will have to pin this for next time I go to make grilled cheese!